Neo-native menswear design house Bstroy certainly had something up its sleeve at its ‘Sweet Screams’ fashion show last week. 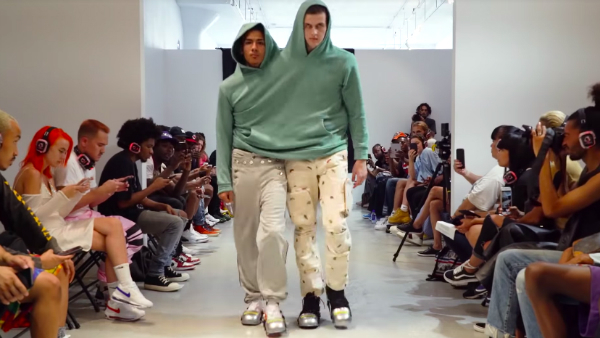 The brand sent two models, entwined in a green double-hooded sweater, down the runway, and if the apparel isn’t friendship goals, pray tell what is. The oversized piece will keep buds with separation anxiety close and snug, and has an extended pocket in the middle to keep your hands toasty—or if you and your companion are the sort, it’ll also function as a compartment for snack reserves. Unfortunately, it’s evidently not for the claustrophobic. Additionally, not everyone—not even the closest of pals—might be comfortable with literally being less than an arm’s length away from each other. It’s not known when the brand will release the hoodie, but fret not, the best relationships will have you feeling warm and fuzzy with or without it.